Woodbridge Government Access: WHAT? Color bars? Cablevision called today (6/08) to say that a technician will be here around noon on Tuesday, 6/13; they are short-staffed at this time and cannot send anyone sooner. With luck we will be live for the Board of Selectmen meeting on Wednesday 6/14. Saturday afternoon (6/03), channel 79 looked fine. Monday morning (6/05) we could only get color bars here in Town Hall. 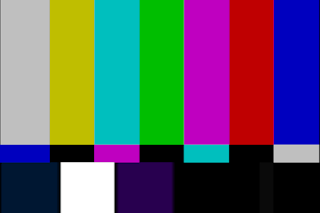 When asked, one viewer reported the color bars and static noise was happening Sunday night. All other channels are OK.
We contacted Cablevision for help. They do not expect to be able to visit us until early in the week of June 12; they are short-staffed at this time. We hope we will be live for the Board of Selectmen meeting on June 14. If you have a mobile device you can watch via http://dv2.discovervideo.com/play/?id=7n437hz&type=flash or by clicking on the "WGATV in a stream" tab. IF YOU USE A CHROME BROWNER ON YOUR COMPUTER, you need to enable Adobe Flash Player. There are directions on the Adobe site here. It's a little arcane, but follow the steps carefully & you should be OK.